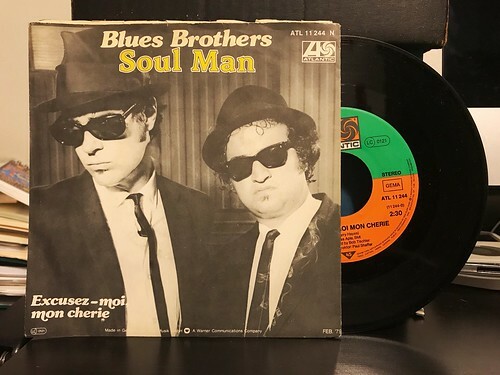 Continuing through Blues Brothers picture sleeve 7"s, we come to the German version of Soul Man. Like many others, the basic artwork for this is a modified version of the album art from the Briefcase Full of Blues full length. This time it's cropped into a close up. The back art is kind of weird as it isn't Blues Brothers related at all, it's just an ad for some other albums by artists like Rod Stewart and AC/DC. As much as I wish each 7" had completely unique artwork, this particular version is probably my favorite that uses the Briefcase artwork as its base. As far as the songs go, this 7" has the same B side as most of the others, "Excusez Moi Mon Cherie." It's kind of funny to me that the one Blues Brothers song I didn't know about until I was an adult actually appeared on so many different releases. I only have a few more Soul Man 7"s left, then it's on to some other songs. Rail - Luke & Lauraland 7"
Balloon Flights - Staten Island 12"
Stephen El Rey - Poor Born 7"
Light FM - Let The Death Toll Rise 7"